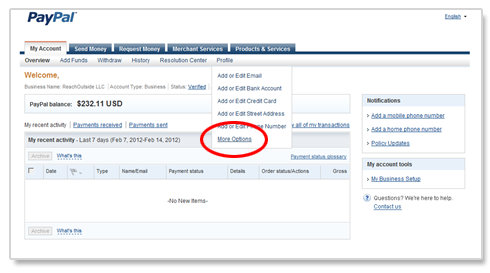 First, you must have a free business PayPal account setup with PayPal. You only need to have the "Standard" version (PayPal Payments Standard). 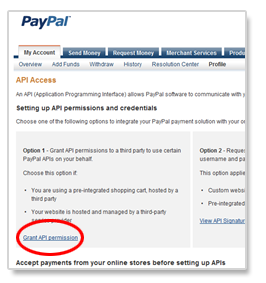 If you don't have a PayPal account, it can be setup in minutes from the PayPal web site. You must also go through the PayPal verification process which links PayPal to your bank account and will not only help to lower your credit card rate, but it will easily allow you to transfer money from PayPal to your bank account. 1. Login to your PayPal Business account and from the main My Account tab, hover over the sub-menu “Profile” item, and click on More Options. 2. Next, on the left-hand menu, click on My Selling Tools. Then, in the main window, click on the Update link next to “API access”. 3. Next, click on Grant API permissions. 4. Enter billing_api1.advancedchef.com in the Username textbox and click on the Lookup button. 5. Next, you must select two checkboxes so that AdvancedChef can issue Pre-Approved payments from your catering customers and then later issue the charge on these payments after the catering event has occurred. 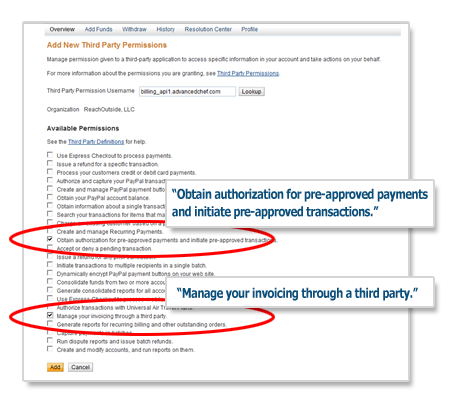 Also, you must grant permissions to AdvancedChef to send One-Click email invoices on your behalf. To do this, select “Obtain authorization for pre-approved payments and initiate pre-approved transactions.” and “Manageyour invoicing through a third party.” Then, click the Add button at the bottom of the page. 6. Lastly, you must login to your CaterShark catering software portal and go to Site Setup --> Manage My Sites. Select the Default site or whatever site you are configuring for your catering business. 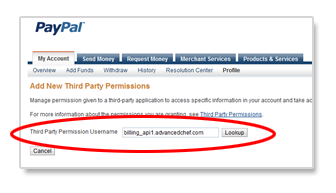 Then, click on the Enable Payments tab and enter your PayPal username (email address) and click the Save button. Note: you must have a CaterShark monthly payment plan that allows usage of the Payments Module before the Enable Payments configuration is accessible.